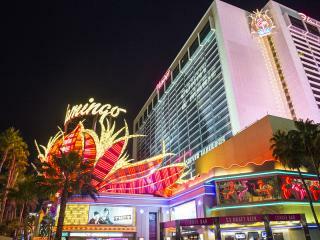 Located on the famous Las Vegas Strip, the Flamingo Las Vegas was the third resort to ever open on the strip and is the oldest Las Vegas Strip resort still in operation. 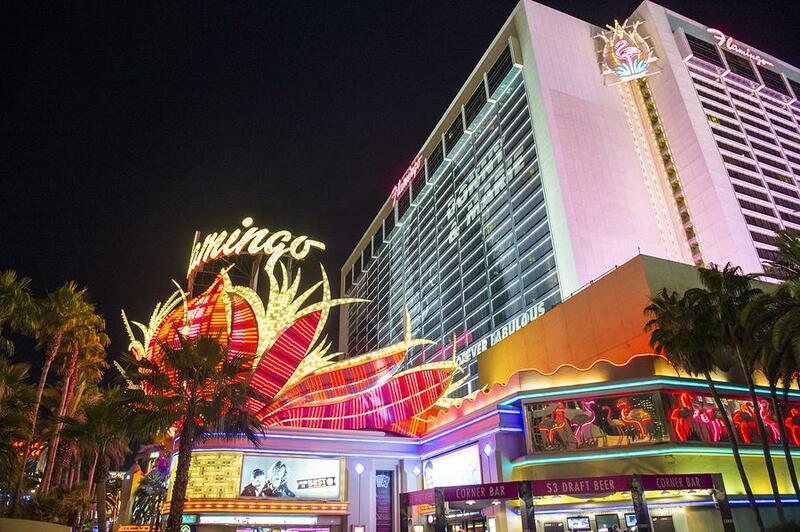 Situated in the heart of the Strip opposite Caesars Palace, the Flamingo features a 77,000 sq ft (7,200 sqm) casino and more than 3,600 hotel rooms. Designed with a mix of Streamline Moderne and Art Deco style, the décor is inspired by the tropical atmosphere of South Beach Miami. Featuring a tropical garden courtyard, the Flamingo Las Vegas is also home to a wildlife habitat featuring, you guessed it, flamingoes! However, this isn't where the hotel originally got its name. Originally opened in 1946 by famous mobster Bugsy Siegel, he named the hotel and casino after the long legs of his showgirl girlfriend. However with rumours of money skimming from the mob, Siegel was murdered in 1947 and is remembered by a plaque situated near the outdoor wedding chapel. These days business is booming and it's no surprise when you consider that Flamingo Las Vegas boasts over 1,600 slot games, a poker room and table games like roulette, blackjack, craps and baccarat or the more relaxing keno lounge. Big name performances can always be seen at the Flamingo with American sweethearts brother and sister duo Donny and Marie Osmond headlining since 2008. From buffets to flavours of the world, Flamingo Las Vegas is home to a wide range of dining options including cafes, a food court, the Paradise Garden Buffet, Japanese and Mexican restaurants, a steakhouse, Beach Club Bar & Grill as well as the famous Jimmy Buffet's Margaritaville where you can waste away with a relaxed island vibe, 220 slot machines, 22 table games, live entertainment, Caribbean-themed cuisine and tequila on tap. It's as much a state of mind as it is a place.